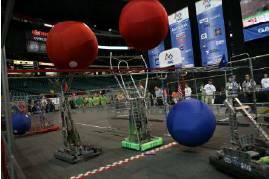 Two ALLIANCES, one red and one blue, composed of three teams each, compete in each MATCH. The object of the game is to attain a higher score than your opponent by making counter-clockwise laps with your robot around the TRACK while moving large 40" TRACKBALLS of your alliance color over and/or under the OVERPASS that bisects the TRACK. A MATCH is 2 minutes and 15 seconds long. 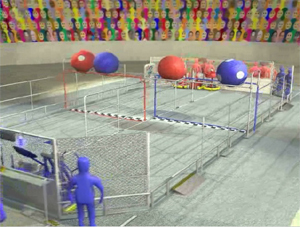 A HYBRID PERIOD starts each MATCH in which the ROBOTS are controlled by pre-programmed instructions and/or transmitted selection from the ROBOCOACH. The HYBRID PERIOD is followed by the TELEOPERATED PERIOD during which the DRIVERS assume control of the robot. -- Hybrid period scoring is 4 pts for each quadrant line crossed by a robot, 8 pts for knocking a trackball off the overpass. -- Teleop period scoring is 2pts for each crossing of the alliance finish line after a lap of the field, 8 pts for hurdling a trackball over the overpass after each ball laps the field, 2 pts for each trackball crossing of the alliance finish line (untouched by an alliance robot) after it laps the field. 46 Teams (.pdf, 19KB) attended the 2008 SBPLI Long Island Regional. 340 Teams (.pdf, 732KB) attended the 2008 Championship in Atlanta. 1501 Teams (.pdf, 267KB) participated in the 2008 FIRST season at 41 Regional events.